It all started with a unicorn. 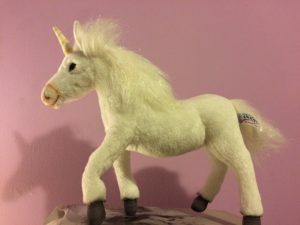 Not the last unicorn, but rather a mass produced stuffed toy unicorn picked up in a NYC store for its lifelike (can a doll of a creature that’s never lived appear lifelike?) features and bendable legs. 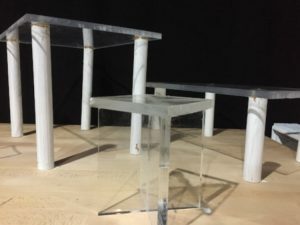 It was the first official prop selected for PLUTO (no longer a play) created by Superhero Clubhouse and playing May 11th through June 3rd at The Brick. PLUTO is an allegory about extinction in which three humans attempt to give a presentation about the remains of a play that no longer exists. The preserved pieces seem to suggest the story of a unicorn, an outcast, and a wizard, all struggling to adapt to a rapidly changing world. Facing similar dilemmas, the three humans stage the story as best they can, searching for hope among the fragments. When selecting material resources for our shows, we use one of SHC’s core tenets of eco-theatre to guide us: imposed limitations. As we collect or build prop, costume, or set pieces, we are always looking for ways to use less, reuse, recycle, or source sustainably with an eye toward what will happen to the item once our show is over. These limitations force us to think deeply about each choice, but also unlocks creative solutions that we might never have discovered if we took the easy, cheap, and often disposable way out of a given theatrical challenge. For PLUTO, we also charged ourselves with the task of tracing some of the materials we used back to their source to get a deeper understanding of their origins. In the spirit our show, which finds its main characters excavating and categorizing the remains of a play, we are cataloging our materials in an archive of sorts. Our collection records ask the viewer to engage beyond standard informational descriptions. We want to examine the raw materials that make up the physical object as well as how those materials exist within larger systems of production, wildlife habitation, and ecology. We were curious about how the production and manufacture of the materials we encountered impact biodiversity. The single largest threat to biodiversity worldwide is habitat loss. This can include loss due to climate change, agriculture, unsustainable forest management, unsustainable water use, and conversion of land for human use like settlements and industrial sprawl. Soil, water, air, noise, and light pollution from industrial processes can all affect animal and plant life. As I researched fabric manufacture, I discovered the hidden environmental costs behind many traditional favorites from the oil and energy intensive process used to make polyester to the carbon footprint left by growing, producing, and harvesting conventional cotton. But what about our cuddly unicorn? It is composed of entirely new materials, but it was specifically sourced from a local store to support small business and avoid the environmental costs of shipping. I found a ton of information online from its maker about how these types of toys (well, toys modeled after real endangered animals, not mystical ones) are educating youth and hopefully inspiring an emotional investment that might lead to future wildlife conservation. What was harder to find was the specifics about how the creation, manufacture, and disposal of the materials in many of these toys might be negatively impacting the habitats of the very animals they are striving to champion. Often, eco organizations encourage people to help endangered animals by donating money. To encourage donations, companies usually send a stuffed likeness of the creature by mail. Everybody wins, right? But what if that adorable black rhinoceros is made from non-biodegradable petroleum-based polyester? Will it still be sitting a in landfill long after all the real black rhinos are dead and gone? Our archive of PLUTO materials wasn’t created to make the search for sustainability feel hopeless. Rather it functions as a starting place to inspire theatremakers and audience members alike to ask questions about the objects all around them. What is it? Where did it come from? What is it made of? What did it take for it to arrive here in my hands? Where will it end up? What are the costs (environmental, human, animal) associated with these answers? What alternative methods and materials exist? Armed with knowledge, how can we seek objects and processes that lessen impacts and reduce harm? Geography: Made in the Philippines. The Philippines is home to a rich biodiversity. According to WWF, of the 167 different mammal species and 10,000 or more species of plants found there, over 60% are native only to this region. Deforestation, whether through uncontrolled logging and mining activities or other human encroachment, is a leading cause of habitat destruction that negatively impacts biodiversity across the country. Some of the most endangered species in the Philippines include the Philippine Eagle, the Tamaraw, and the Philippine Tarsier. Credit Line: Purchased at Dinosaur Hill, East Village, Manhattan, 2016. Maker: BB Dakota. Offers vegan faux leather alternatives in its line. Geography: Made in China. According to WWF, habitat loss due to human activities and development are the most significant threats to biodiversity in China. Over-hunting and climate change are also significant threats to amphibians, reptiles and mammals. WWF’s Living Planet Report China, 2015, found that almost half of China’s terrestrial vertebrates have vanished in the last 40 years. Some of China’s most endangered animals include the Crested Ibis, the South China Tiger, and Giant Pandas. 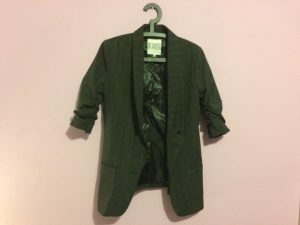 Medium: Oil processed into polyester (64%), cellulose of wood pulp/cotton treated with chemicals and processed into Rayon (34%), polyurethane polymer processed into Spandex (2%) China produces about 69% of the world’s polyester. Chinese textile factories that burn coal for energy are responsible for producing about three billion tons of soot every year according to NRDC. Credit Line: Purchased from Salvation Army thrift store in Astoria, NY 2017. Maker: Cree Semiconductors. From Cree: “Cree is focused on the ethical sourcing of minerals used in our products and is committed to complying with the Dodd-Frank Act requirements… Cree supports the stated goal of the Dodd-Frank Act of preventing armed groups in the Democratic Republic of Congo and adjoining countries from profiting from the sale of Conflict Minerals…Cree continues to assess, with input from our suppliers, whether our products contain Conflict Minerals (tin, tantalum, tungsten, and gold) derived from sources which have been identified as ‘Conflict-Free.’"
Geography: Manufactured in Texas. Loss and fragmentation of habitat are the top causes for the decline of species in Texas. Endangered species in the region include the Gray and Red Wolf, Mexican Long-nosed Bat, Black Lace Cactus, Tooth Cave Spider, Hawksbill Sea Turtle, and the Whooping Crane. Medium: InGaN materials with proprietary G•SIC® substrates. 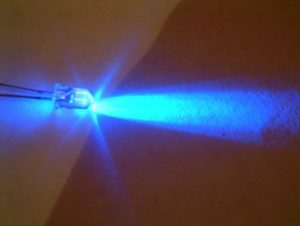 InGaN, or Indium gallium nitride, is a light-emitting semiconductor material used in modern blue and green LEDs. It is usually grown on a GaN buffer on a transparent substrate such silicon carbide. Maker: Big Reuse. From the company’s mission: NYC’s construction and demolition industry throws away nearly 7,000,000 tons of building materials annually! These materials clog our landfills, release carbon into the atmosphere, and create an artificial need for more materials to be manufactured. By salvaging usable items from demolition and remodel projects and reintroducing them to the market, we take a small step toward eliminating these significant environmental costs. Our goal is to demonstrate another option for materials diversion and hopefully inspire the city to require recycling and reuse for construction and demolition waste. Geography: Manufacture location unknown. Reclaimed from Big Reuse in Queens, NYC. New York City is home to endangered species including the Peregrine Falcon. From NYC.gov: In New York State, the Department of Environmental Conservation (DEC) is responsible for developing a Statewide Recovery Plan for the Peregrine… and protecting nesting sites. Current NYC Peregrine population is 32 known birds. Medium: Acrylic plastic (commonly known by its brand name Plexiglas). Acrylic plastic manufacturing involves highly toxic substances and fumes. Polymerization processes require careful storage, handling, and disposal of materials to reduce risk for humans and the environment. Acrylic plastic is classified as a number 7 plastic, and thus not collected for recycling in most areas.